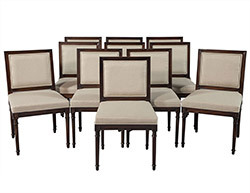 Compared to the traditions of the past, dining chairs no longer need to perfectly match your table. Now more than ever is a great time to create a perfect set of custom chairs to suit your space, your tastes, and your needs. 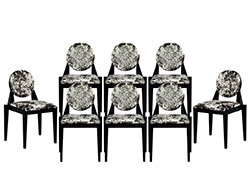 When you decide to create the chairs, the following are important things to keep in mind. 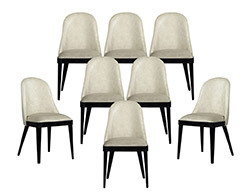 What Style Do You Want Your Chairs to Be? When considering the design of your custom dining chairs, the overall style is an important factor to take into account. This includes the era you want to model them after, their size, detailing and shaping the legs, any wood detailing desired, whether you want single chairs or benches, and if you want to have any armchairs. When it comes to the back of the chair, you need to decide the height of the backs as well as their shape and design, including whether you want them to be upholstered and whether they should be completely solid or if you want details such as openings or woodwork. Which Fabric Will Best Suit Your Needs? The next step when designing your chairs is to determine which fabric to use. Depending on your lifestyle and décor as well as the ages of the people who will frequently be eating there, some fabric choices may be better than others in terms of stain resistance or their ability to be cleaned. Common choices for upholstery include leather, cotton, velvet, or no upholstery at all and keeping a natural all wood finish. You can also choose textured fabric, or have it patterned to your liking. What Details Do You Desire? The final touches for your chair are the finishes and details. This includes tufts, studs, and trim, as well as deciding the finish of any exposed nail heads. You can also select any additional details you want to put on the chair such as woodwork and staining. 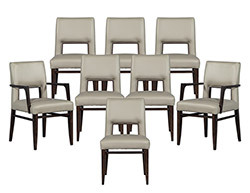 If you’re looking for custom dining chairs or reupholstery for your current chairs, the experts at Carrocel can help. Our 20,000 square-foot showroom located at 245 Bridgeland Avenue in central Toronto contains a wide variety of examples, showcasing ideas that can be customized to match your needs.